World travel health alerts for 16th of January 2019. At least two regional neighbours have issued alerts in response to the dengue outbreak declared earlier this month – Grenada and the Cayman Islands, while Antigua has reported 10 cases of confirmed dengue fever, seven requiring hospitalisation, with ages ranging from 11 months up to 82 years from seven different localities (English Harbour, Jennings, Ovals, Ottos, Gambles, Potters and Gray’s Farm). Measles is a highly contagious virus and can cause serious illness in people of all ages. Most cases reported in Australia are linked to overseas travel - both developing and developed countries. Travelvax Australia recommends travellers check their immunisation status for measles and other childhood diseases such as diphtheria, whooping cough (pertussis) and mumps 6 weeks before departure. Although widespread in Mexico, Central America, and South America, Chagas disease presents a low risk to Australians travelling to the Americas. Travellers who sleep indoors in air-conditioned or screened hotel rooms are at low risk for exposure to infected triatomine bugs (aka kissing or assassin bugs), which infest poor-quality dwellings and are active mainly at night. However, as has become more common, the disease can also be transmitted through food and freshly pressed juice contaminated with the faeces of insects attracted to ripening fruit. Read more on Chagas disease. Seventeen health zones have now been affected in the Ebola virus disease outbreak in the country’s NE - the latest being Manguredjipa - although at least 10 are considered active. Read WHO Deputy Director-General for Emergency Preparedness and Response, Dr Peter Salama’s twitter update. Read more in the Ministry of Health’s Jan 15 newsletter. The National Environment Agency is calling for the public to do the ‘5-step Mozzie Wipeout’ after surveillance revealed more of the dengue vectors in December, rounding out 2018 with nearly 20 percent more dengue cases (compared to 2017). In the first two weeks of the year, 455 cases have been recorded and the NEA is monitoring 53 active clusters – 12 are considered high-risk. The five step process is even more important currently because ‘as the Chinese New Year festive season approaches, homes and other premises are decorated with more ornamental plants’ – popular breeding sites for Aedes aegypti mosquitoes. (Read the CDC Travel Notice re 2019 Lunar New Year travel.) Read more. While in Malaysia, statistics from the iDengue website, show cases since December 30 have climbed to more than 6,000 with most in the state of Selangor. Numbers had been trending upwards from mid-September to the end of the year, according to a WHO report. Thirty states were reporting widespread flu activity in the most recent reporting week (ending Jan 5). Read more. CDC modelling suggests the number of hospitalisations for flu is lower than for previous years - between 69,000 and 84,000. 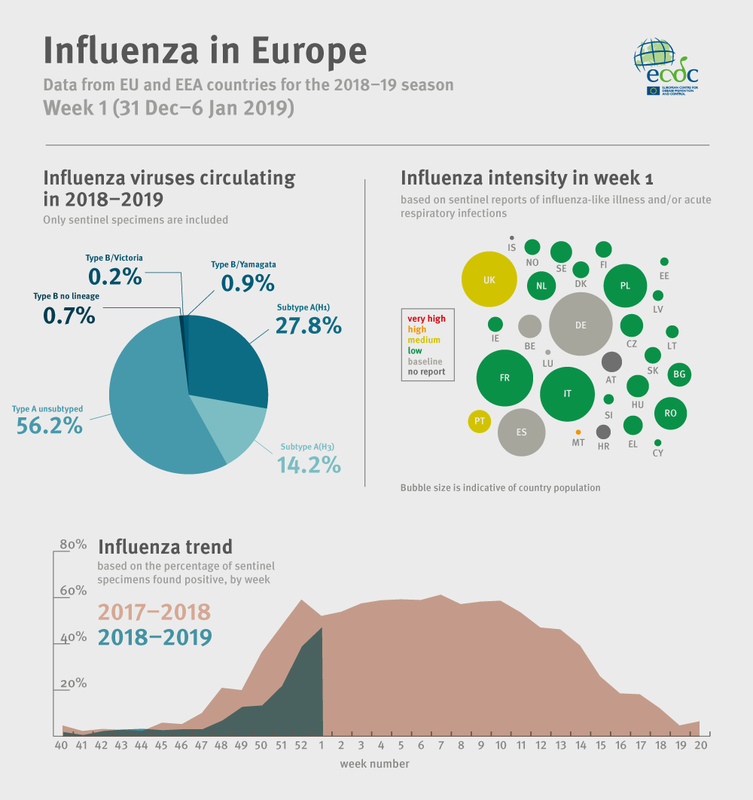 An ECDC infographic shows low levels of flu activity for most of Europe in the first week of January, with the exception of the UK and Portugal (medium). Type A influenza viruses predominate according to the Communicable Disease Threats Report, week 2. Chikungunya virus is spread by the same daytime-feeding mosquitoes that transmit dengue fever. There is no vaccine and preventing infection relies on avoiding mosquito bites. Apply an effective repellent when outdoors to all exposed skin. Read more about chikungunya.